Seems that VDC is very helpfull but has its limits like a viscous LSD. Nothing can replace a true locker. maybe but locker wont help if your wheels lifting from ground . i felt as wheels tried ti spin and then stopped and then again .. it was because it was more flex that car could manage. i was thinking at that moment what locker could give in that situation. well front locker maybe but not rear one, because i needed precision and not slide off that thing as i could damage something on car . i should come back there with another person to be outside with camera and recording so i could see as well what my wheels actually doing there. 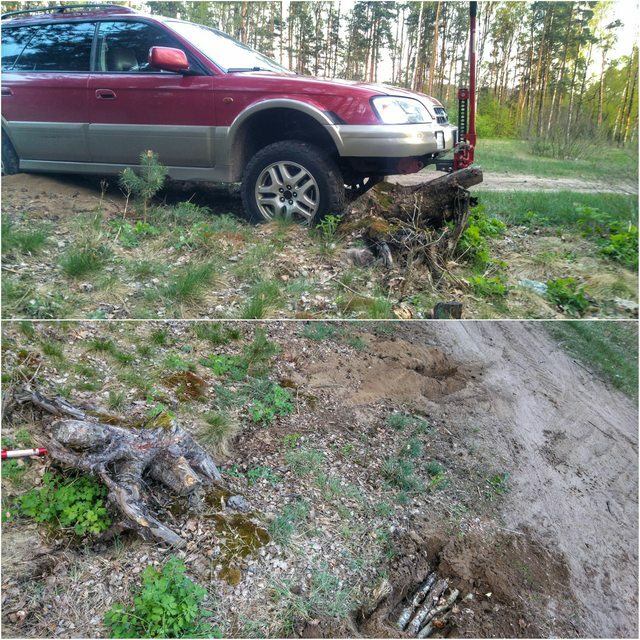 after i drove back i found that those 2 wheels that lost traction where dug little holes on ground as they tried to push car up. well VDC or traction control is nothing like LSD . i have rear LSD and its not so great actually. it might be helpful in some cases as driving and when your rear starts to slide a little. i tested that a lot on snow in winter . i like to test my car of safe roads or fields as much as i can and learn what car do and how. Fixed camber problem with new front spacers offsets now with oem strut bolts camber is just right well from eye. Glad for that i fixed it myself. Still wierd stuff that with same height spacers my driver side is almost 1cm higher then passenger side in front. But i measured that all my wheels ate on diff height rear too. Must be used shocks and springs makes that. Still left that rear wheel bearing to change which starts howl loud after 90km/h . but its less noisy after i made right camber alignment and rotated tires. And yesterday changed both diffs oil .will fix couple more isues before start going more to lakes and forests out there. Last edited by scalman; 29th April 2018 at 12:12 AM. btw i sanded front rims with hard sandpaper for now and tried black on center rims covers. does it look better with black center or silver ? Last edited by scalman; 29th April 2018 at 04:21 PM. I don't understand your opinion about true differential lockers. 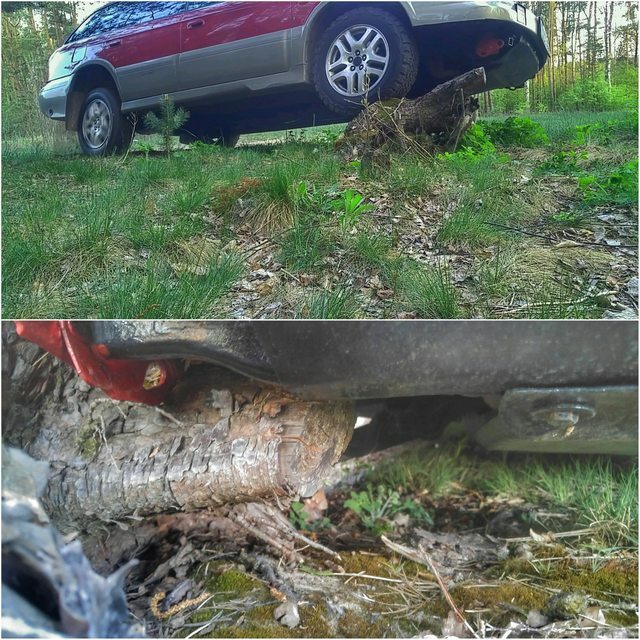 On that tree trunk, with a rear differential locker, you would climb easily. By the way, I like black wheels ! so i said rear locker would help there.i like lockers as optional thing sure. but they could make more agresive traction control that would work as locker. i was just needed more torque in that rear wheel that had grip. maybe 3.0 engine would help there some too. when VDC cuts engine power its just not much power is left then i guess. cant just say locker would drive there. it depends still of car of flex . it was so soft surface there that i dig in so fast . on hard surface i would drove there too. With your VDC Outback, just fit a helical front or/and rear differential and you're done ! aha i wish . how much its cost ? you mean that one custom made ? i dont do expensive mods. that was all point of subaru. and not that i ever will have real life situation like that tree stump. noone would drive on it anyway. places that i drove i never thought : ohh wish i have locker. i would then think more like : wish i had 4wd car maybe. and VDC cuts engine power really a lot in some situations. like hard up hill on grass. just imposible go slow because not enough torque to wheels. p.s. have nothing against lockers. just there is nothing to tests on locker its just locked . done. with traction control its more interesting for me to test it find good and bad point of it and use it advantages. I have Quaife differentials, they cost about 800€ so thats not cheap. They are not custom made but the front one had to be machined to fit the low range gearing. ouch price for me. my point subaru = cheap and capable as it is with little mods. thou i payed 1/3 car price for 4 tires. and i payed for them in parts whole year. thats how we live here with 650-700 euros month salary. and thats not bad salary here. and i choose job and free time over money , thats why i got back from uk . there money was better but so what i was just misserable with ****** job. Yeah, I understand, a car is not a piggy bank for sure !